Information is power—but only if you’re able to access and use it. The continued growth of medical imaging for the diagnosis and treatment of a broad range of medical conditions is a case in point. While imaging has proven to be an invaluable tool for medical practice, there is a great deal of information associated with those images that has barely been tapped. Imaging is primarily used to determine the present condition of a patient, but work is under way to allow clinicians to extract quantitative information from images in an effort to help identify disease earlier, predict prognosis, and assess treatment efficacy as well. “The concept is to have the computer do a little bit more than just display the image, which is already in a digital form for the radiologist, but to look into the image and extract [information] about the abnormality seen on the image that will let the radiologist better assess what is happening to the patient’s disease,” says Daniel L. Rubin, MD, MS, an assistant professor of radiology and medicine (biomedical informatics research) at Stanford University. Doing this requires the collection and measurement of available data that aren’t routinely used, in part because it would be unduly time consuming to sort them manually. Automated processes that are being developed allow these data to be organized in ways that are more useful to clinicians. The collective name for these processes is quantitative imaging, and it’s particularly useful with cardiology and oncology applications that use sequential scans over time to track a patient’s condition. Rubin chaired a session at this year’s Society for Imaging Informatics in Medicine annual meeting that examined quantitative imaging’s role in clinical practice. Quantitative imaging provides clinicians with a more accurate picture of a disease state by applying to medical images algorithms that precisely measure various aspects of an abnormality. By accruing a sufficient database of measurements, comparisons between specific features from one case and similar features from other cases become possible. In much the same way that a credit card company profiles its customers by comparing shopping patterns, quantitative imaging can profile patients based on information contained in medical images. Until now, the limiting factors have been IT and sample size, but that is changing. Nonquantitative measures, such as hand measurements, are not sensitive enough for this type of endeavor. Besides being time consuming, they are difficult to reproduce because they depend on an individual radiologist’s perception. Allowing machines to measure items such as lesion volume, linear dimension, the amount of radioactivity, and the distribution of activity within a lesion and then express those values as a number will potentially lead to less variation in clinical practice. In addition, precise numeric values may alert clinicians to minute changes that are difficult to discern with traditional methods, allowing a faster clinical response. Other types of measures include numeric characterization of the shape or texture of a lesion, which is usually expressed in semantic terms. There are already numeric values within such images that correlate to these features, but they require postprocessing to make them available to clinicians. Rubin says semantic annotation can also be achieved through the use of controlled terms, such as RSNA’s RadLex. As long as radiologists describe certain terms the same way, the text can be converted to a machine-accessible form to provide a more complete description of the image. Rubin envisions quantitative data being populated directly into radiology reports or graphic summaries of quantitative information being incorporated into reports. It’s also possible that applications could analyze radiology reports and turn them into more useful summaries. Such applications might look at something such as the total amount of tumor in a body over time or suggest whether a particular drug is working. Such information could potentially be linked to a decision-support function that provides a differential diagnosis. However, he notes that workflow integration will be necessary before these types of applications become routine. The first step in making that happen is the development of standards that will allow for the storage and communication of quantitative data across multiple systems in the same way that DICOM allows images to flow. Rubin cites Annotation Imaging Markup (AIM), a standard developed by the National Cancer Institute’s Cancer Biomedical Informatics Grid, as a promising model for this type of transaction. AIM enables the reuse, repurposing, and commonization of image measurements that are made on different vendor platforms. He adds that there is a movement among imaging informatics professionals to incorporate AIM into DICOM. 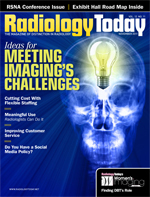 Vendor support of standardization initiatives would provide a big boost to these efforts, but whether vendors ultimately incorporate quantitative imaging standards into their offerings or third-party software becomes the enabling technology, it seems certain that quantitative tools will eventually be available to radiologists. What isn’t known is which tools will be available, and that will be driven mainly by what radiologists find useful. Rubin says the goal is not simply to provide more information to radiologists but to provide more information that can be readily used to improve diagnosis and patient care.